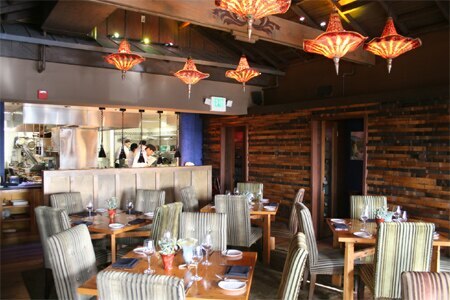 Classy, rustic South Laguna hot-spot for modern American cuisine, coffee and gourmet snacks. : Sapphire Laguna captures Laguna Beach’s dual nature as a homespun artist community and sophisticated coastal city. Chef Azmin Ghahreman presides over this charming bistro, which channels his passion for world cuisines. Located in the Old Pottery Place complex in the space formerly occupied by The Pottery Shack, Sapphire Laguna owes its look to interior designer Si Teller, who combined Craftsman-style open architecture and warm woods with touches like hand-blown glass from local artist John Barber. Ghahreman’s contemporary dishes draw plenty of excitement by exploring global tastes. This is demonstrated with aplomb through starters like Vietnamese beef carpaccio and North African lamb dumplings with fava beans, walnuts, yogurt and za'atar. Ghahreman shows a delicate touch with fish dishes like the Hawaiian-style steamed barramundi. The chef is also adept at coaxing good flavors from meat, evidenced by the grilled rib-eye steak and pan-seared beef tenderloin, the latter of which is served with lobster ravioli. What to drink with your meal can present a pleasant challenge, as the cellar features more than 900 well-chosen wines. After you’ve polished off the bread pudding, head over to the adjacent Sapphire Pantry to shop for some hard-to-find international cheeses, fine wines, charcuterie, deli items and chocolates to go.